After raising the bar of men’s tennis via his astonishing defeat of World Number 1 Novak Djokovic in the US Open final, Rafa Nadal is prompting many to believe that he is not only chasing but could also overtake the ‘FedExpress’ of 17 Grand Slam wins. The addition of the US Slam’s title means that 13 titles now embellish the 27-year old Spaniard’s name. And a return to the top of the world rankings as well as overtaking Federer’s World Record of Grand Slam titles certainly seems like a possibility in Rafa’s near future. Once again, Rafa is poised to lift men’s tennis to another level as well as retain a firm place at the top of the modern tennis game. 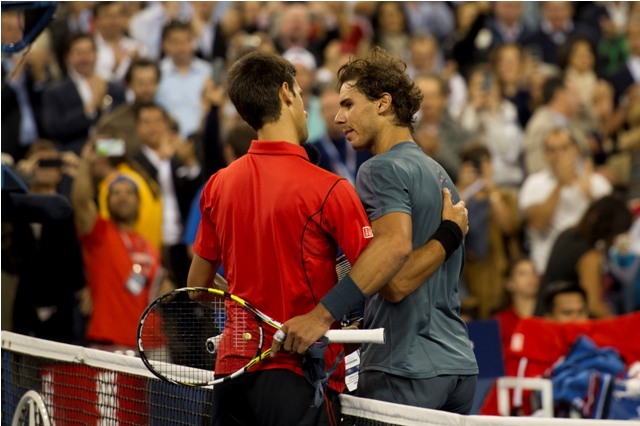 Despite Djokovic throwing out every weapon in his mighty arsenal during that enthralling final of the last Slam of the year, Nadal triumphed and claimed his second US Open title victory. Well known as that ‘King of Clay’, Nadal has added another dimension to his return serve and more speed into his forehand, making him undefeated so far this year on concrete courts. After a disappointing Wimbledon appearance, Nadal has added Masters titles in Montreal, Cincinnati and Indian Wells to his already eye-watering collection of wins. Now with added firepower, Nadal’s defensive skills have made him a significant foe for top player Djokovic, and his left-handed serve has opened up new gameplay that far surpasses his previous form. An opinion shared by 7-time Grand Slam champ John McEnroe – “To me, he’s better than ever….he can easily win four of five more slams, no question about it”. Nadal’s blistering new form has also drawn the attention of Boris Becker, who believes that “the man from Spain is getting awfully close (to Federer’s record) The more he plays and puts on shows…the closer he’s going to get. If Nadal stays healthy until he’s 30 he’s going to get to 17”.